Copyrightlaws.com’s U.S. Copyright Law eTutorial is a 10 e-lesson eTutorial primer/refresher that demystifies U.S. copyright law. Each e-lesson provides up-to-date information on the topic listed, sets out fundamentals for that topic, has a self-marking quiz, and provides URLs for further reading. U.S. Copyright Law is one of the five eTutorials offered through our Copyright Leadership Certificate. Ask us how it counts as credit toward the certificate program. You will receive a Certificate of Completion at the end of this eTutorial. Explain how U.S. copyright law works and how to obtain copyright protection in the U.S. I received some training on copyright when I started my job as a librarian a year ago. I understood enough about copyright for our daily operations. After completing the U.S. 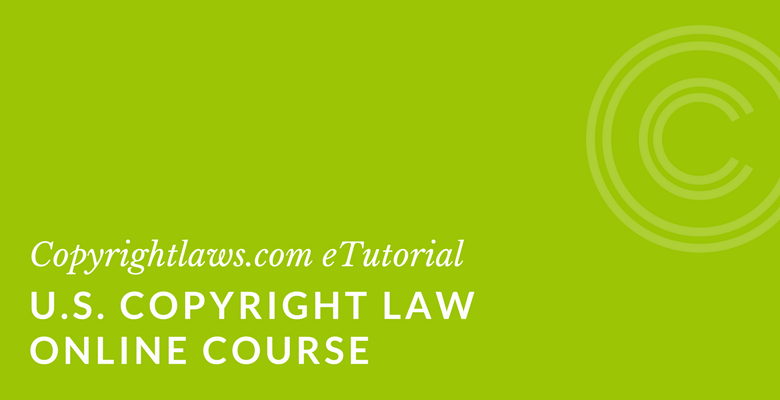 Copyright Law eTutorial I feel have a much deeper understanding of copyright law, how to make sure the company is following it, and what the consequences are if there’s an instance of copyright infringement. I can also better explain to patrons why some practices are allowed and others aren’t. — Chelsea Embree, Research Librarian, Schweitzer Engineering Laboratories, Inc. The Copyright Leadership Certificate exceeded my expectations. I did not expect the course to cover as much material as it did. I will be applying a number of changes throughout the rest of year due to what I learned in the Certificate program, mostly to our copyright guidelines. I would absolutely recommend this program to others. See all of Copyrightlaws.com’s courses.